When traveling through Russia last month to promote his new book, Crisci gave a presentation at the US Embassy. Sadly there was only a small group of us there to hear his interesting journey into Russia to explore the story of Lylia Litvyak. Chasing small threads he traveled to Lilia's childhood neighborhood, military base and the town where she is now buried to collect bits of information and gain an understanding into who this woman was to base a story off of. 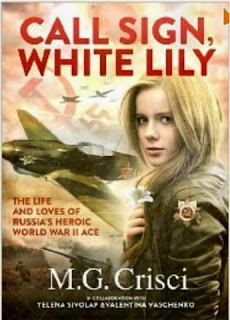 Call Sign, White Lily is a historic novel based on the life of Lilia Litvyak who was a fighter pilot in the Soviet Air Force during WWII. During the two years of her service she became the first female shooter to shoot down an enemy plane the first female to earn the title "fighter ace". She holds the record for the most kills by a female in her 66 combat missions. She was shot down and killed in battle. A fascination in the story of this woman helped me to persist in reading this book because to be honest, the writing was rather mediocre. Several times I found myself reading sentences or phrases over and over trying to figure out what the author was trying to convey. The book is written in a very elementary style. Crisci stated that this was done on purpose to give the feeling of a story being translated from Russian into English. I didn't feel this sense of translation as I was reading it rather just very simple, basic writing. So despite the slow writing style, the book gave me yet another glimpse into a facet of Russian history and a Russian hero.